Physical characteristics: Western grebes stand 21.6 to 29.5 inches (55 to 75 centimeters) tall and weigh 1.8 to 4 pounds (0.8 to 1.8 kilograms). Females are smaller than males. The body is narrow, the neck and bill long. Breeding adults are black from the top of the head to below the eye. The rest of the top part of the body is blackish with sides being spotted with gray. Undersides are white. Nonbreeding adults are similar but with less contrast between the black/gray and white areas. Eyes are red and the bill is green. Geographic range: Western grebes are found in central Mexico and western North America. They winter on the coast of Texas and the Pacific coast south to Baja California. Habitat: Western grebes breed on lakes and marshes with large areas of open waters, both fresh and brackish. They like the reedy shores for building their nests. These birds winter on salt lakes or in coastal waters. Diet: Western grebes eat almost nothing but fish. They often spike fish with their pointed bills. Western grebes can dive for periods of up to forty seconds. Behavior and reproduction: Western grebes form colonies, sometimes up to several thousand birds. 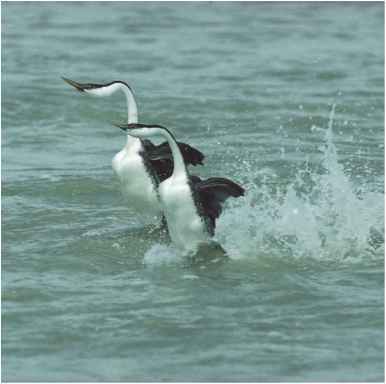 They have well-developed courtship displays, including the ability to "dance" on water in pairs. Females lay eggs just once each year, and the timing depends more on the availability of food than on the seasons. Females usually lay two to six eggs in nests that are 3 to 12 feet (2 to 4 meters) apart and built out of wetland vegetation. The nests are found in the protective environment of the reedy waters. 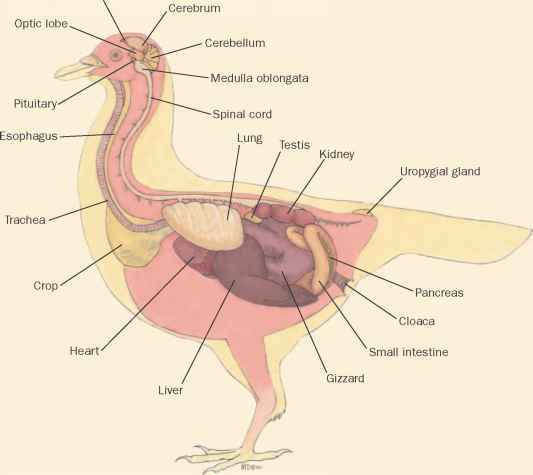 Incubation lasts from twenty-two to twenty-four days, and both parents raise the chicks and carry them on their backs. Chicks are independent at eight weeks. Western grebes and people: These birds often fall victim to oil spills while wintering in the coastal waters. They also have had reduced breeding success in areas where insecticides used for agriculture wash into their wintering habitats. Konter, Andre. Grebes of Our World. Barcelona: Lynx Edicions, 2001. Ogilvie, Malcolm, and Chris Rose. Grebes of the World. New York: Bruce Coleman, 2002. Simmons, K. E. The Great Crested Grebe. Buckinghamshire, U.K.: Shire Publications, 1999. Seago, Michael J. "Great Crested Grebe." Birds of Britain (May 2004). Online at http://www.birdsofbritain.co.uk/bird-guide/g-c-grebe.htm (accessed on July 13, 2004). American Birding Association. http://www.americanbirding.org (accessed on July 13, 2004). "Great crested grebe." Royal Society for the Protection of Birds. http://www.rspb.org.uk/birds/guide/gZgreatcrestedgrebe/index.asp (accessed May 27, 2004). "Order Podicipediformes." Animal Diversity Web. http://animaldiversity .ummz.umich.edu/site/accounts/information/Podicipediformes.html (accessed May 27, 2004). "What's the Story on Oil Spills?" National Oceanic and Atmospheric Administration, Office of Response and Restoration. http://response. restoration.noaa.gov/kids/spills.html (accessed on May 27, 2004).